Hannah doesn’t smile much and she laughs even less. For a comedian, that’s a bit like being a Transformer who doesn’t fancy driving. But don’t let that deter you. There is great pleasure to be had in laughing at her. 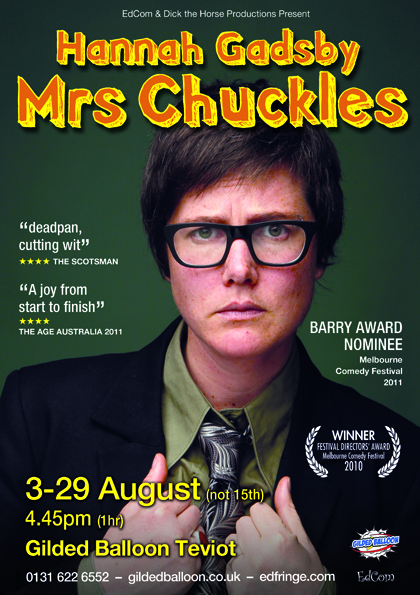 Barry Award-nominated for Best Show at the 2011 Melbourne Comedy Festival (where she had to be moved to a bigger venue following ticket demand) and for Best Comedy at the prestigious 2011 Helpmann Award, Mrs Chuckles is a tale of mild success and utter failure told in a manner of vague indifference and total incredulity. It is mostly funny and only fleetingly offensive.